Rare barn find found in California. 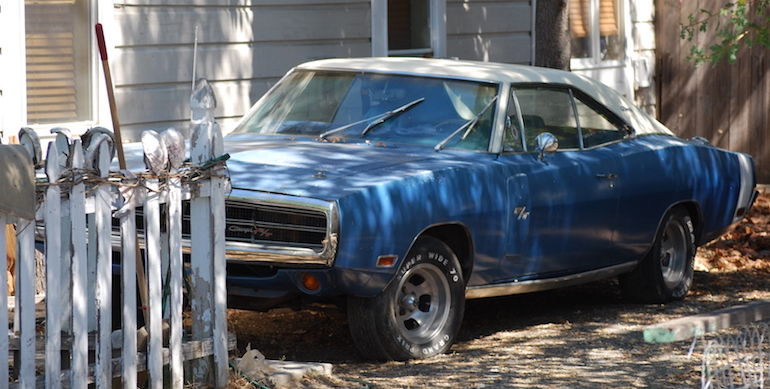 This 1970 R/T Charger in almost survivor car condition. It’s not clear what engine is in this sleek coupe from muscle-car times, but it sure is pretty to look at! The 1970 model was the last of this classic ‘Dukes of Hazzard’ body style and had exterior refinements like a full chromed wrap bumper and a sleek rear tail light design very similar to the Dodge Chargers of 2018. This particular barn-find is looking great with a bone white vinyl top, 1970s style sprint rims and white letter Grand Prix tires. The R/T badging is there in the grille, just to the left of the driver’s headlight flap and you can just make out the rear facing air scoops in the leading edge of the driver’s door with another R/T badge. The rear panel wrap stripe appears authentic to the year and model, so this might be a top scoring survivor. Not sure if it is matching numbered, or if it has the rare 440 cubic inch six pack, but it’s a great snapshot, and nice to see someone knows how to decorate their California bungalow!